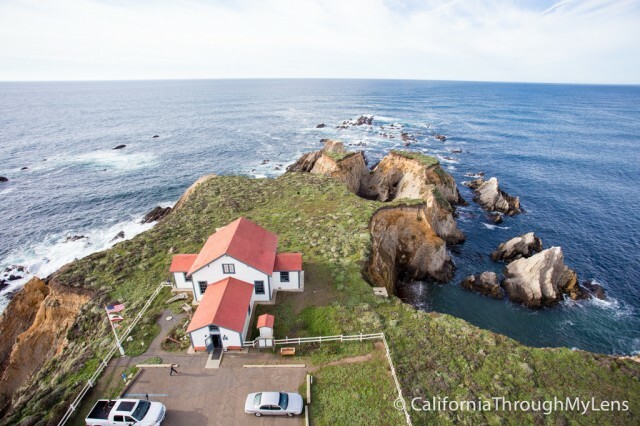 When traveling on the 2 mile dirt road that leads to the Point Arena Lighthouse you will feel as if you have transformed to a simpler time in California’s history. 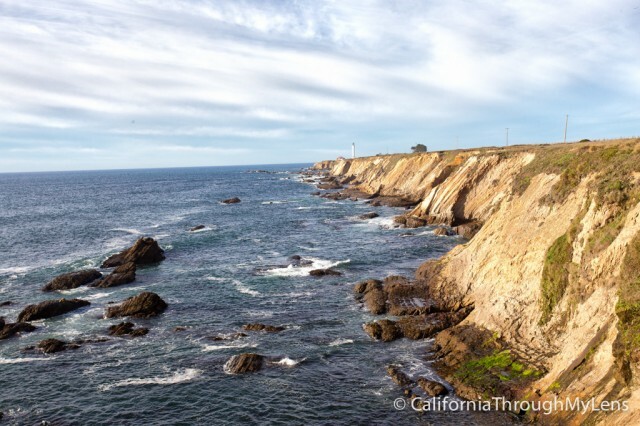 The two lane Highway 1 melts into the distance and all that is before you is a tall lighthouse sitting out on the bluffs. 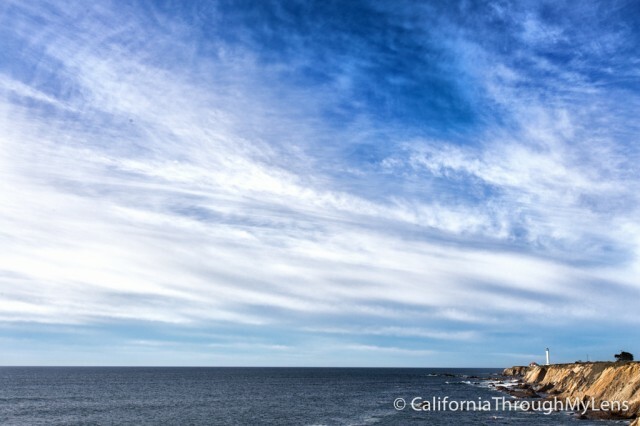 At 115 feet, this is one of the most majestic lighthouses on the California coast and at $5 for a ticket to the top it is a must visit during any Pacific Coast Highway roadtrip. 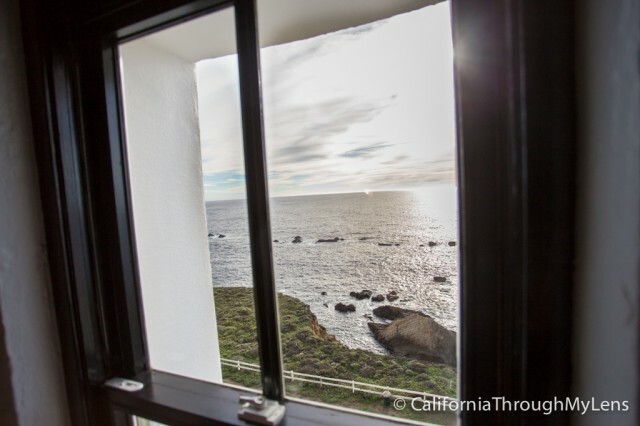 The lighthouse at Point Arena was constructed in 1870. The brick tower included large iron balcony supports and a large massive residence that could house several families. 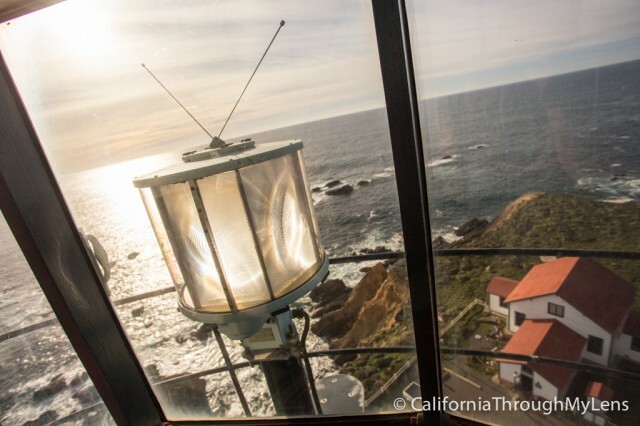 In April 1906, a devastating earthquake struck lighthouse though and both the residence and the lighthouse were so damaged they had to be destroyed. 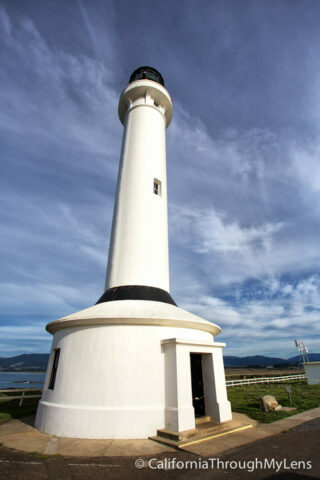 A team was created to rebuild the lighthouse and it began operation in 1908, nearly 18 months after the quake. This lighthouse was taken over by a non-profit in 1984 which is who mans it today. As you are driving to the lighthouse you must stop at the small turnout on the left hand side about 3/4 ths of the way to the lighthouse. This view was one of my favorite views on my entire roadtrip. The way that the water crashes against the bluffs and the bluffs lead your eye to the lighthouse in the distance is a magical place for photography or just standing in awe. After you are done taking it in then proceed to the ticket booth to pay your $5 for a ticket to the top. 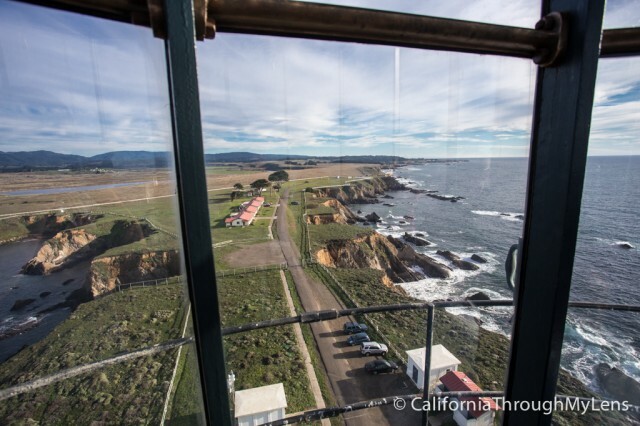 There is no reason not to do this as it keeps the lighthouse funded and provides a great experience of getting to climb up this historic structure for a breathtaking view. 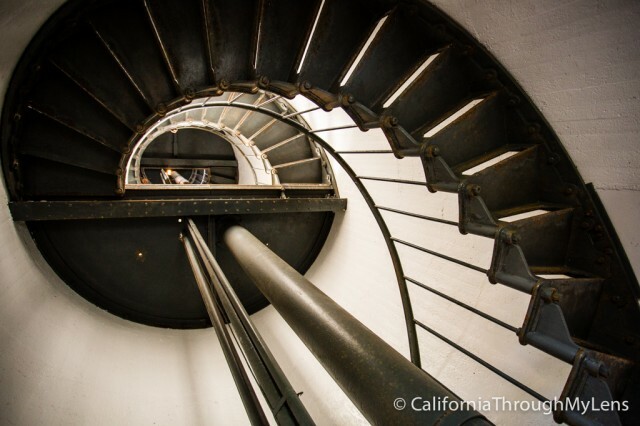 When we arrived at the base of the lighthouse we were ushered into the museum / gift shop where we waited for our turn to head up to the top. 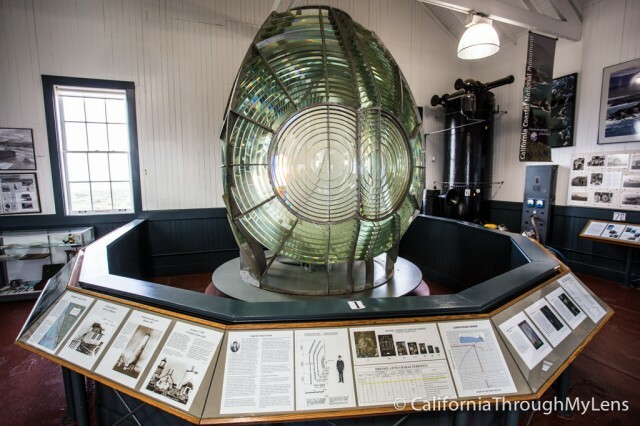 Inside the museum is a ton of history on both the lighthouse and the area. 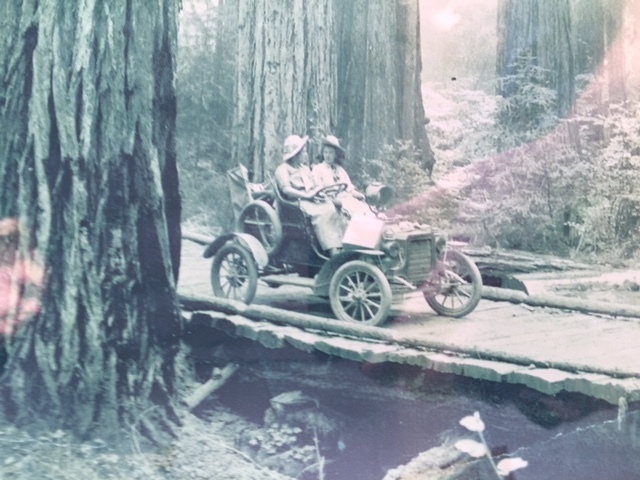 As I was perusing the plaques I came across this awesome photo of two women driving on an old wooden road in the redwoods that I had to share here. 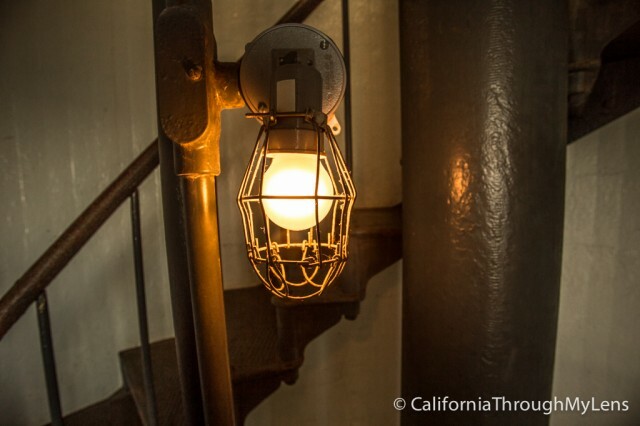 In the main room they also have the old light that used to be at the top of the lighthouse. It was massive and a lot bigger then I anticipated. They said it could be seen 21 miles away though which is pretty crazy to think about. 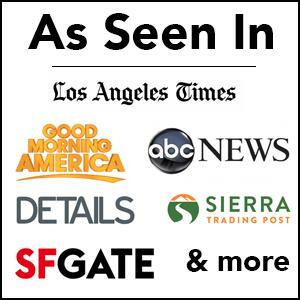 There is a lot of great information on Mendocino County here as well that I would suggest you pick up if you are looking for more stops in the area. After waiting for about 10 minutes if was finally our turn to head up the lighthouse steps. 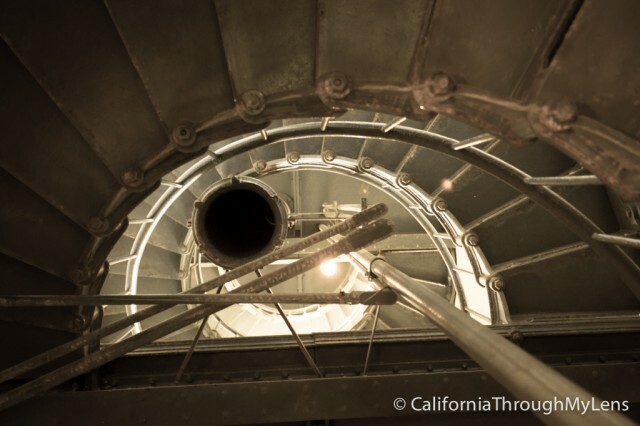 As you would anticipate the spiral staircase here is not for the faint of heart. 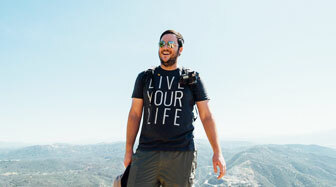 At 100 feet of elevation gain to get to the top it climbs fast and will have you breathing hard by the top. Along the way there are windows to look out as you increase in height and be sure to look up to see the view of the staircase as it ascends. When you reach the top there is a volunteer working up there who lets you walk along the outside before taking you up to where the light was actually housed. 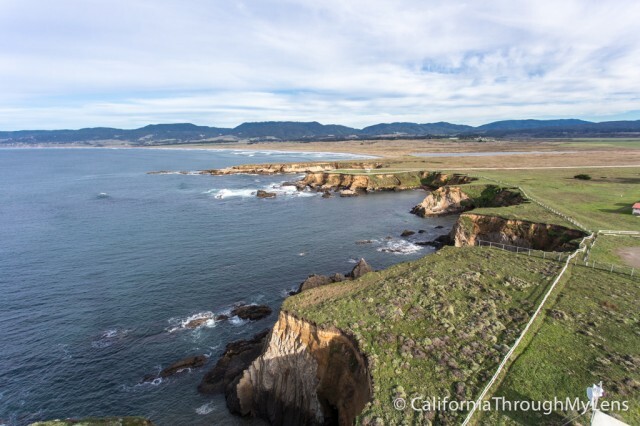 As I walked around the outside I was treated to amazing views of the coastline I had just traveled up and the museum 100 feet below me. It was beautiful and allowed for great pictures. After circling the top we headed up to the glass enclosed area that held the light. 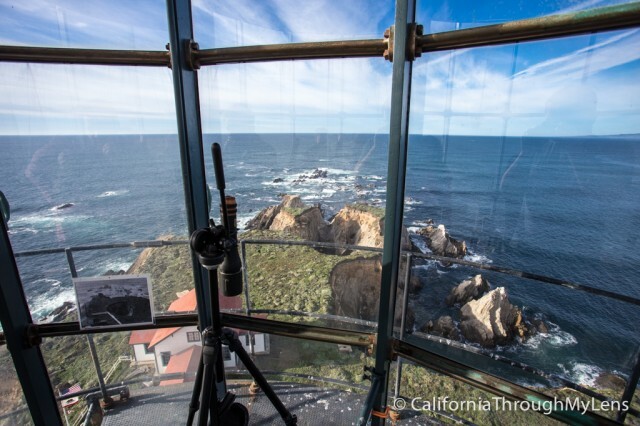 This provided another great 360 degree view and the man who was working there told us a lot of history about the lighthouse. One of the most interesting things was that they believe the bluffs will not be able to hold the lighthouse within about 30 years, at the rate they are receding. They are hoping to get funding to move it back before that happens, I hope they are able to as well so that we do not lose this historical site. Also of note, they still have a small light in the lighthouse but it only has one small bulb in it. They said you can still see it from really far away though. After listening to the talk we were free to continue exploring or to head back down to the bottom. 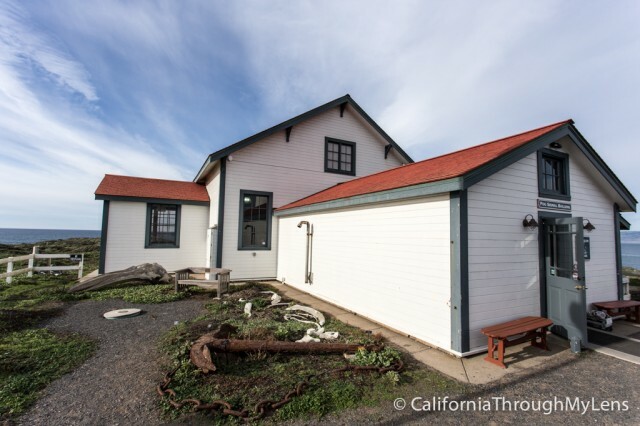 Also of note, there are three vacation rentals near the base of the lighthouse that can be checked out if you are interested in staying in something unique such as that. 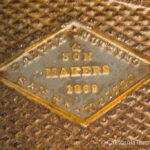 All in all this is a beautifully maintained historical structure. 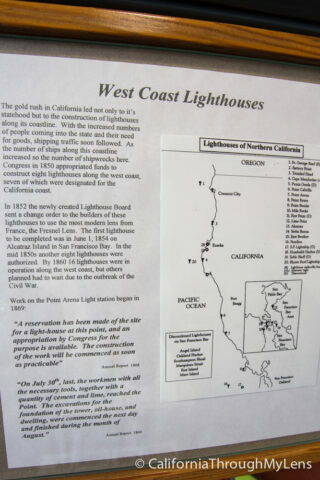 It is a must visit on Pacific Coast Highway and is one of the better lighthouses in California. Let me know if you have gone and also let me know what other lighthouses you enjoy as well in the comments.